Synthetic fragrances can be damaging to our health. While listening to a talk by the scientist Anne Steinemann on Radio National’s ‘Big Idea’, I was astonished to hear that as many as one third of all Australians experience strong reactions to fragranced products (1). These reactions are sometimes serious, including migraine headaches and asthma attacks (listen to the podcast here ). While I find synthetic fragrances unpleasant, I am lucky that I don’t have these physical reactions to them. For those not so fortunate, fragrances make life a misery because they are so difficult to avoid. Many people wear scented perfumes and skin care products, while stores, hotels, workplaces and public bathrooms are almost always infused with fragrance. What’s more, many homes contain fragranced toiletries, laundry products, cleaning products and air fresheners that are a disaster zone for this one third of our population. What exactly is in these fragrances that causes reactions? The problem with existing labelling laws means that, in most cases, we have no way of knowing what chemicals are included in fragranced products. This is because it is not necessary to list the chemicals used in the fragrance of any product - simply the word ‘fragrance’ or ‘parfum’ is sufficient. Alarmingly, a fragrance may be a blend of hundreds of different chemicals, some of which may cause immediate symptoms such as asthma or migraine, while others are known carcinogens, hormone disrupters (eg phthalates) or other toxins, with the potential to have more long-term effects. Yet manufacturers of these products operate within existing law. When Anne Steinemann tested a range of fragranced products (2), she found that the most common hazardous chemicals were terpenes such as limonene, a chemical with a citrus scent, that can be extracted from citrus peel or manufactured synthetically; and alpha- and beta-pinene, which have a pine scent. The terpenes are not particularly problematic in themselves ( read about them here ), however when they react with ozone in the air they produce secondary pollutants including formaldehyde, a strong irritant that is also carcinogenic. Ozone, which is required to convert the terpenes into toxic chemicals, is present at higher levels in poorly ventilated locations and at high temperatures. Perhaps more concerning was that half the products tested by Steinemann released one or more carcinogenic compounds, including 1,4-dioxane, formaldehyde, acetaldehyde, and methylene chloride, which have no safe threshold of exposure, according to the U.S. Environmental Protection Agency. Those of us who do not react immediately to fragranced products are still unknowingly exposed to these more insidious toxins. These worrisome ingredients are not exempt from so-called ‘green’ products either. Steinemann’s study detected dangerous compounds in green products as frequently as mainstream products. 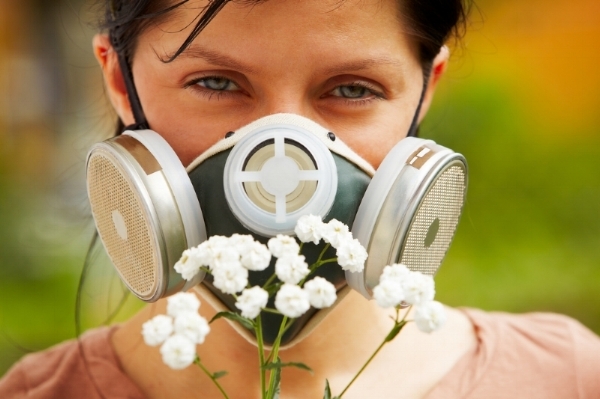 How can we avoid exposure to these toxic fragrances? Because of the inadequacy of labelling laws, any product with a fragrance could contain harmful ingredients. Cleaning products do not need to list any ingredients, while personal care products need to list all ingredients except the constituents of their fragrance. Luckily, there are many internet sites that identify safe cleaning alternatives, like this one . You can find a non toxic and effective substitute for virtually any cleaning product. For personal care products, we suggest you avoid products that use the ‘fragrance’ or ‘parfum’ identifier, choosing only those that list the ingredients fully and that use safer fragrances like certified organic essential oils (see more on this below). Alternatively, opt for fragrance-free options which are becoming more readily available. If you’re concerned about the quality of air in your home, from fragrances, furniture or other potentially toxic sources, you can book an expert consultation to have the air assessed, for example, through Perth-based econscious living . I was interested to hear what Anne Steinemann had to say about essential oils, because many essential oils contain high levels of limonene and other terpenes that can be converted in the presence of ozone to more dangerous compounds. Limonene is found at high levels in citrus essential oils, as well as a number of other essential oils. We tend to think of synthetic fragrances as more problematic than plant-derived ones, but the presence of limonene could mean a lot of essential oils are out too, right? Well, maybe not. The terpenes tend to be irritant only when they are oxidised (3), and oxidation can be avoided by using fresh essential oils, and by the addition of antioxidants like vitamin E and rosemary leaf extract. Formation of toxic compounds, like formaldehyde, from terpenes occurs in the presence of ozone, which is less likely to occur in a cool, well-ventilated space. Interestingly, Anne Steinemann reports that naturally derived limonene, unlike synthetic limonene, tends not to cause symptoms, since most people who react to limonene are not sensitised to citrus fruits and citrus essential oils. She believes this may be because the structure of the synthetic limonene molecule is different to the natural form, though studies to verify this are ongoing. Certified organic essential oils offer an additional safety feature, since in order to be classified as certified organic, they must not be extracted with organic solvents. These organic solvents may contaminate conventional essential oils extracted in this way, and are known sensitisers that can lead to development of allergic type reactions. A final note is that some essential oils, including those high in limonene, have been shown to have anti-cancer potential (4). Furthermore, the benefits of essential oils in a range of conditions are well understood (5). Firstly, every ingredient is listed on our products. We identify any essential oils we include, and never use the terms ‘fragrance’ or ‘parfum’, so that sensitive individuals can avoid an ingredient if necessary. Secondly, all our skin care products other than our soaps contain certified organic essential oils, which means they are not contaminated with potentially harmful organic solvents. Finally, we have a broad range of products free of fragrances, so you can safely side-step the fragrance issue altogether if you need to. 3. Christensson, B. et al (2009) Air oxidation increases skin irritation from fragrance terpenes. Contact Dermatitis. 60:32-40. 4. Bayala, B. et al. (2014) Anticancer activity of essential oils and their chemical components - a review. Am J Cancer Res. 4: 591–607. 5. PDQ Cancer Information Summaries [Internet]. Aromatherapy and Essential Oils (PDQ®). Health Professional Version. PDQ Integrative, Alternative, and Complementary Therapies Editorial Board. Published online: December 13, 2017.